Please pray for the Gulf Coast region, especially New Orleans, as yet another hurricane bears down, maybe worse than the last one. I only moved from South Mississippi a few weeks ago, and in the intervening space it seems like my home region can’t stay out of the news, and it’s not been good news. 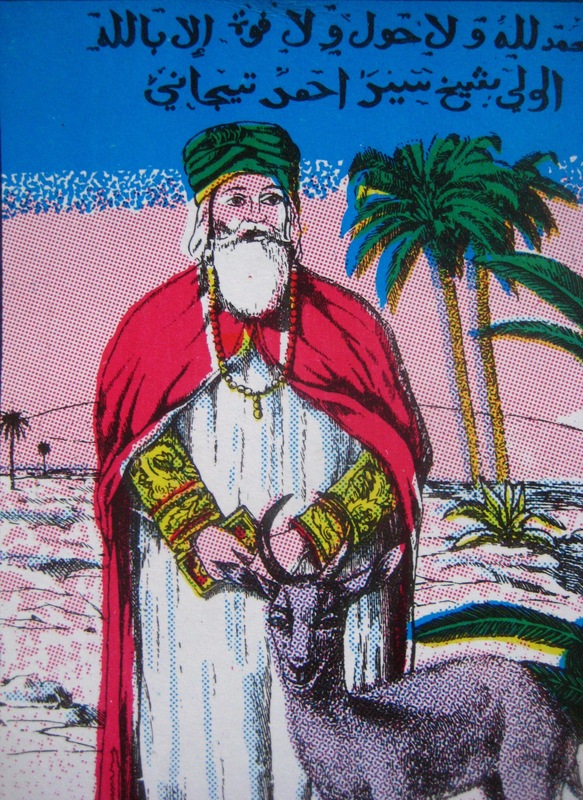 The images below come from a card-stock poster I found at a miniature flea-market of sorts an elderly Fassi would hold pretty regularly on the north side of the Qarawiyyin Mosque. He had, among other things, a couple other similar posters, along with random booklets, magazines, spoons and forks, and various trinkets and odds and ends. 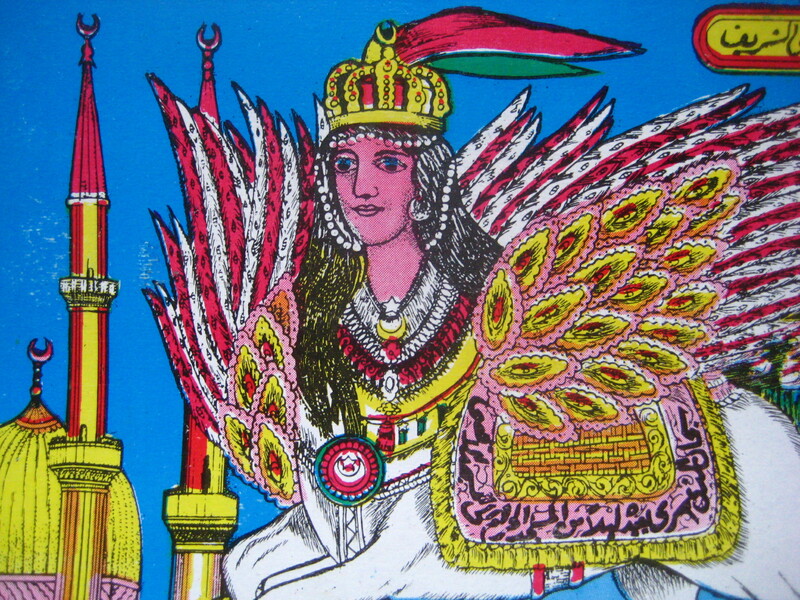 The iconography is what caught my eye- while iconography of various kinds is common enough in Morocco, this particular example stood out for its colorfulness and the sheer volume of visual activity in one piece of card-stock. I don’t know the origin or the history of this document, other than that it was probably produced in Fes, as one of the scenes is of Ahmad al-Tijani, whose zaouia is only a few streets over from al-Qarawiyyin. 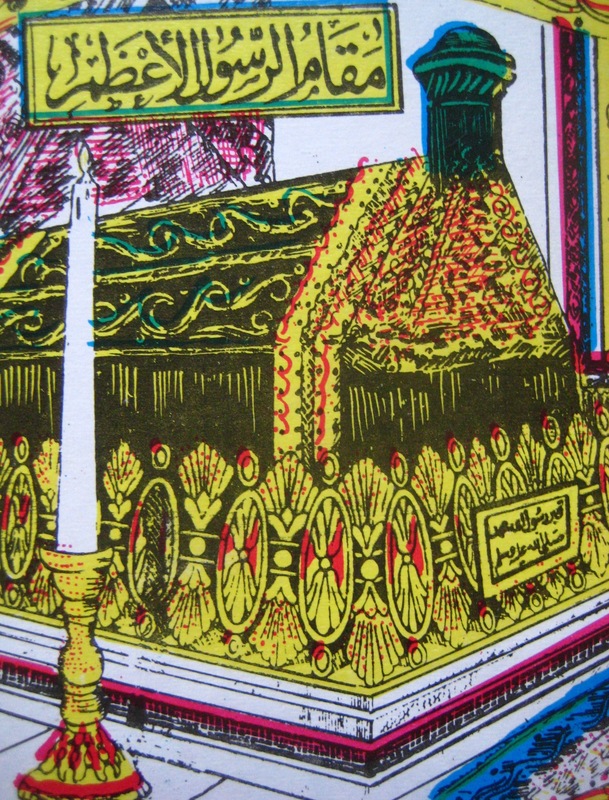 Here we have a picture of the tomb of Muhammad, ‘the exalted prophet’ according to the text above the tomb. Obviously, this an image that would resonate all across the Islamic world, though I suspect it has a special resonance in North Africa where the tombs of saints are particularly important as sources of baraka, blessing/grace/power. One more- the famous Buraq, the winged creature that features in the story of Muhammad’s Night Journey. 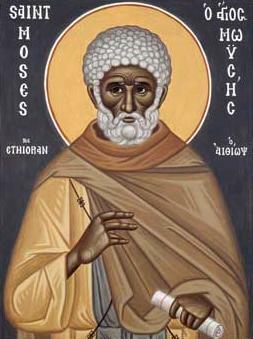 Today is the feast-day of St. Moses, who had led a life of crime and violence before renouncing the sword and entering a monastery in the Egyptian wilderness. Thinking about his story and his example makes me wonder- how do we renounce the violence and injustice in our lives? Sure, I might not be going around beating people up and stealing their money literally, but what am I doing- or not doing- that perpetuates violence, whether it is through my unforgiveness, or resentment, or my lack of concern and love. That, and how much are we culpable for participating in the unjust structures we live in? The other night I was re-reading the book of Revelations, as part of a class assignment actually, and in doing so I was struck by how incredibly political the book is. God judges the systems and ways of the world- a world that is bloated with injustice, with greed and consumption, not just of goods and capital, but of humans. The saints are called out of that system, out of that world- they refuse to participate in it, and for that they suffer. Those who refuse the mark of the beast- participation in the evil and injustice of the world- suffer for it. I thought while reading, how do we refuse that injustice, how do we refuse to take the mark of the beast, as it were, while living lives in the world? How do we reject the callous and bloodthirsty ways of the world- what is the correct path? Does the fact that I pay taxes, for example, make me complicit in the wars and intrigues of the government I thereby support? 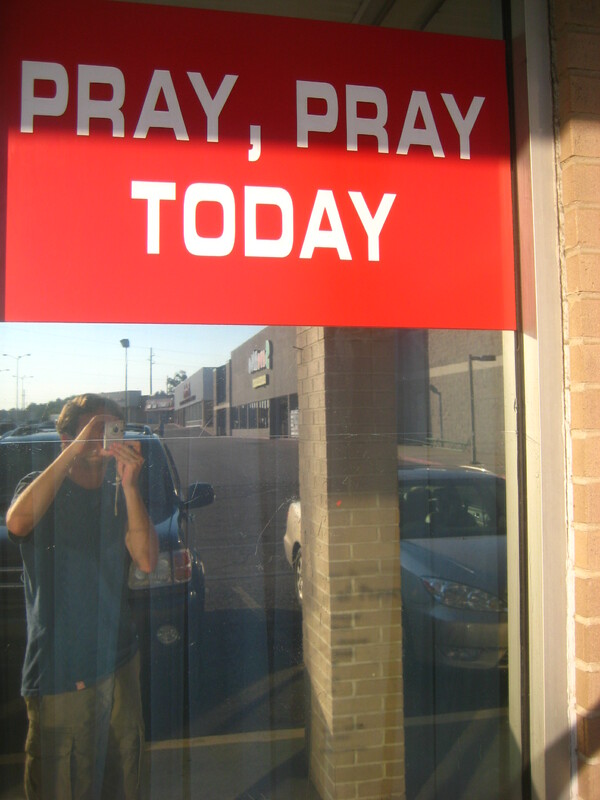 What I am going to tell Christ when He asks about the homeless living a mile from my house, the panhandlers I meet on the sidewalks and do my best to get away from? Sorry, Lord, they were the wrong sort of poor? I’m sorry, God, I disagreed intellectually with the evil I ignored/was complicit in. Will that cut it? For St. Moses, living a life of Christ’s peace in the world was, in some ways, very straightforward- he put down the sword, literally. In a less obvious way, he taught and modeled forgiveness, the root of the peace of Christ. There is a story in which a brother is brought before the community for judgment; St. Moses comes to the church carrying a jar of water with holes in it. The brothers ask about it, and he replies, my sins are like water- they run out behind me and I cannot number them. How am I to judge my brother here then? He lived the life of Christ’s peace and forgiveness, of his rejection of the methods and systems of the world. He, like Christ, died- not just the death to the flesh, to the ways of the world, but literally. What are we called to? What am I called to in this place I live, in this city, now, to live in a concrete, painful if need be, the life of Christ, the Prince of Peace, in a world of war and hate and violence? That is the struggle- and it is the most important thing, to live-in-Christ, here, now. St. Moses, pray for us who live in a world of drawn swords and angry hearts- pray that we would be blessed with the wisdom and the peace of Christ, our God. You made the wilderness your dwelling, O our Father Moses, the Bearer of God; you became an angel in the flesh and a wonderworker. Through fasts, vigils, and prayers, you obtained from God special graces to heal the sick and sanctify the souls of those who come to you with trust. Glory to the one who gave you strength! Glory to the one who crowned you! Glory to the one who, through your intercession, grants healing to all! Theodore Abū Qurrah was the first Christian writer whose name has come down to us to write in Arabic. As such, he is particularly interesting for his early approach to presenting Christian theology and praxis in an environment that had already become heavily Islamicized by his lifetime (755-830 AD) a hundred years after the Arab conquest and the establishment of the Umayyid state in Syria. One of the changes Abū Qurrah dealt with in his writings was the change in Christian attitude towards icons, or, more specifically, the public veneration of icons in church. In early Islam particularly, depictions of humans was, if not completely proscribed, considered with extreme suspicion if not outright declaration of being forbidden. While this attitude has hardly ever really been universal, and is by no means universal now (while in Fes I purchased a wonderful poster of scenes from the Qu’ran and Islamic legend, plus a local saint, which I will eventually get around to scanning onto my computer and posting one of these days, ان شاء الله), the iconoclastic current of Islam has always been strong, and was particularly hostile to Christian iconography in Abū Qurrah’s day. More specifically, Christians were being mocked by their Muslim neighbors, and accused of being idolatrous, because of their veneration of icons. Now, granted, being mocked and insulted is a hardly out and out persecution, but in a miliue that had become heavily Islamicized, and with Muslims occupying the highest positions, this sort of mockery had a deep impact. Plus, Christianity had already undergone the massive shock of Islamic conquest, which by itself tended to weaken the hold of Christian dogma on the masses. Mocking icons and calling them idols was only one more element in the weakening and dissolution of Christianity as a popular religion (something Abū Qurrah states in his defense of icons in fact). 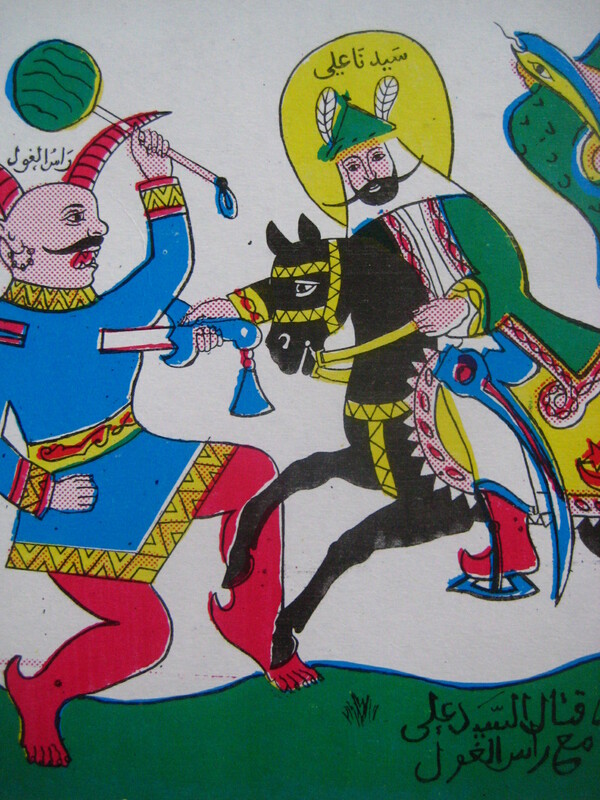 Not only were icons themselves mocked, but the depiction of Christ crucified was a particular object of scorn, as the Qur’an states very explicitly that Christ was not crucified, and for Sunni Islam the crucifixion is very incongruous with the way God is expected to act (Shia Islam, on the other hand, very much embraces the idea of redemptive suffering and shame, but that is another story). How Abū Qurrah responds to the charges regarding Christ and the seeming foolishness and weakness evidenced in the Christian account is fascinating- he embraces the seeming absurdity of Christian doctrine- but here I would like to draw attention to a passage from his work ‘A Treatise on the Veneration of the Holy Icons’ (translated by Sidney Griffith) in which he deals with icons, and, more specifically, the veneration offered to them. The passage is noteworthy because he seeks to establish analogies within both Judaism (his preferred, and generally safer, debate partner throughout this particular polemic) and Islam for Christian practice. After establishing Jewish and Islamic parallels or analogies he goes on to describe Christian practice, thereby attempting to remove some of the distance between the three faiths- and hence somewhat reduce the polemical sting and weight of arguments against Christianity (since he is hardly attempting some sort of ecumenical unity or agreement). However, in this brief passage there is a good example of what Abū Qurrah is doing- reproducing earlier arguments (St. John of Damascus is continually in the background) and re-contextualizing them in the new Islamic environment. From Chapter XI: ‘It is inevitable that the act of prostration goes to what the intention has in mind in the flexing of the knees, putting down the forehead, and the direction one faces. Since this is so, anyone with a question should understand that Jacob made a prostration on Joseph’s staff, intending thereby to honor Joseph… So too we Christians, when we make prostration in front of an icon of Christ or of the saints, our prostration is certainly not to the panels or to the colors. Rather, it is only to Christ, to whom every kind of act of prostration is due, and to the saints to whom it is due by way of honor. ‘One should also recall what we said about everyone who makes a prostration to God; his two knees touch but the ground or a carpet, yet his prostration is conveyed only according to what he intends- to make an act of prostration to God. A second, more direct reference to Islam comes a little earlier in the text, in Chapter IX, in which Abū Qurrah quotes from the Qur’an and employs at the conclusion a distinctly Qur’anic sounding phrase. I got a call from a friend this afternoon; after I answered he told me, in a completely unironic tone of voice, that his mother had been detained by the Feds. Now, knowing his mother, I could hardly imagine a person less likely to be detained by any law enforcement agency, for anything. So I chuckled, but when he didn’t laugh, I asked if he was serious. He was. When I spoke to him this afternoon his mom was apparently still being detained and questioned. His mother, along with hundreds of other people, were detained and questioned in a massive ICE raid on Jones County, MS’s (my home county) Howard Industries. His mom, I should note, is not Latino, and could never be mistaken for being Latino or any sort of undocumented worker of any sort. Apparently she is being questioned- and detained for we don’t know how long- in order to extract further records on the undocumented workers at Howards. My friend didn’t know a lot of particulars, as the Feds apparenty, in addition to shutting off the company’s physical telephone switchboard (reported in the article), also jammed celluar communications. As you might imagine, the raid completely shut down the company, which is the largest employer in Jones County. Without Howards and a couple of other large employers there wouldn’t really be much of an economy in Jones County; one can imagine what sort of impact this will have on the economy. Racial tensions in Jones County between locals and the new Latino population have been generally good; I have encountered more positive sentiments than otherwise from both whites and blacks in Jones County. I wonder whether that will change for the worse in the aftermath of the raid- probably.